Giant Hogweed is not easily confused with other wild plants on this web site. Giant Hogweed must surely be the best known of our introduced plants. Not only is it extremely large – growing to a height of 5 metres – which makes it very easy to identify, but it is also known and feared for its ability to inflict horrible blisters or burns on anyone unwise enough to touch it. 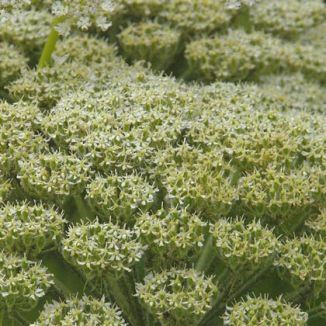 Originally introduced from the Caucusus as a stately garden plant, it is a perennial with ridged, stout, purple blotched stems which carry numerous cream-white flowers (10mm) in large umbels (50cm across) in June and July. The leaves are pinnately divided and long (1m). This plant belongs to the family Apiaceae. I first recorded this plant growing beside the Shanganagh River in Co Dublin in 1980 and I photographed it in the same place in 2005. 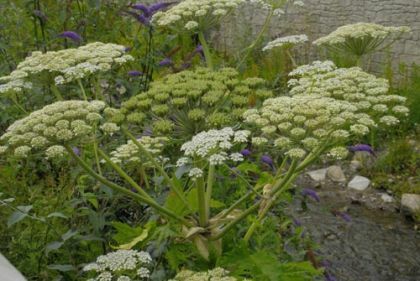 It is because Giant Hogweed is a phototoxic plant that it can do so much damage. Its sap can cause severe reactions on skin which has touched it, and this is made worse if the skin is exposed to sunlight. The first symptom to occur is itching, then follows blistering and the scars can last for a long, long time. In the Republic of Ireland Wildlife (Amendment) Act 2000, it states that anyone who plants or otherwise causes to grow in a wild state in any place in the State any species of (exotic) flora, or the flowers, roots, seeds or spores of (exotic) flora shall be guilty of an offence. However there is no specific legislation which addresses the particular menace of Giant Hogweed in the Republic of Ireland. On Schedule 9 of the Wildlife (Northern Ireland) Order 1985 it is an offence to plant Giant Hogweed or cause it to grow in the wild.